Well I did for a start! I chose this auspicious day to move the Data Liberate web site from one hosting provider to another. The reasons why are a whole other messy story, but I did need some help on the WordPress side of things and [quite rightly in my opinion] they had ‘gone dark’ in support of the SOPA protests. Frustration, but in a good cause. Looking at the press coverage from my side of the Atlantic, such as from BBC News, it seems that some in Congress have also started to take notice. 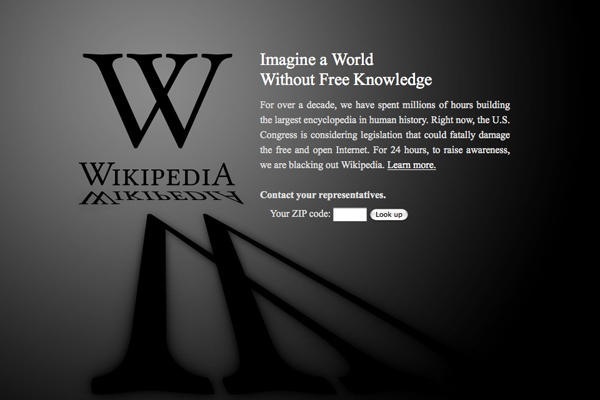 The most fuss in general seemed to be around Wikipedia going dark, demonstrating what the world would be like without the free and easy access to information we have become used to. All in all I believe the campaign has been surprisingly effective on the visible web. However, what prompted this post was trying to ascertain how effective it was on the Data Web, which almost by definition is the invisible web. 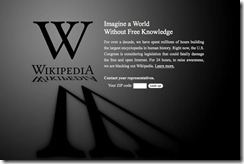 Ahead of the dark day, a move started on the Semantic Web and Linked Open Data mailing lists to replicate what Wikipedia was doing by going dark on Dbpedia – the Linked Data version of Wikipedia structured information. The discussion was based around the fact that SOPA would not discriminate between human readable web pages and machine-to-machine data transfer and linking, therefore we [concerned about the free web] should be concerned. Of that there was little argument. The main issue was that systems, consuming data that suddenly goes away, would just fail. This was countered by the assertion that, regardless of the machines in the data pipeline, there will always be a human at the end. Responsible systems providers, should be aware of the issue and report the error/reason to their consuming humans. Some suggested that instead of delivering the expected data, systems [operated by those that are] protesting, should provide data explaining the issue. How many application developers have taken this circumstance in to account in their design I wonder. If you, as a human, are accessing a SPARQL endpoint, are presented with a ‘dark’ page, you can understand and come back to query tomorrow. If you are a system getting different types of, or no, data back, you will see an error. The question I have is, who using systems that use Linked Data [that went dark] noticed that there was either a problem, or preferably an effect of the protest? I suspect the answer is very few, but I would like to hear the experiences of others on this. What Is Your Data’s Star Rating(s)?